Sri Viswaroopa Panchamukha Anjaneya Swami Foundation is a charitable Trust, established by Poojya Sri Venkatesa Battachar Swamigal. The foundation has established an ashram at Tiruvallur wherein a 40 feet monolithic green granite murti of Lord Viswaroopa Panchamukha Hanuman(also known as Panchamukhi Hanuman) has been installed and regular poojas are being conducted six times a day. The work of constructing the superstructure over the deity is under progress. Tiruvallur is located about 45 kms from chennai (Tamil Nadu, India) enroute to the famous tirupathi Sri Venkatesa temple. 1)This is the only pradishta in the world to be made under Mantra Shastra.The powerful Moola Manthras or Sacred Mantras of Sri Panchamukha Hanuman will be displayed on the walls of the ashram, to be chanted by the devotees, without any discrimination.One of the principal objectives of our Foundation is the propagation of Mantra,Yantra Shastras. 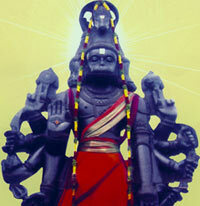 2) The place of location of the ashram,Thiruvallur,was known as Rudra vanam in the past. It was the holy abode of saints and Siddhas like Sage Agastiya. Inspite of rapid strides in technological advancement, there is a growing insecurity for the average human being both physical and emotional. 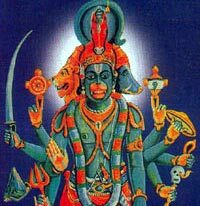 The solution is definitely outside the realm of our perception.The ever merciful Viswaroopa Panchamukha Hanuman promises this very security to all devotees. So we request devotees to participate in this project and get blessed by Sri Panchamukha Hanuman and Lord Shri Ram.The whole project is estimated to cost Rs. 4 crores. For more details about contributing to our project, Please visit our Donations page.